(Newser) – A meteor exploded in a fireball in the Earth's atmosphere in December—surely a spectacular sight, but no one seems to have seen it. The blast occurred over the Bering Sea, off Russia's Kamchatka Peninsula, the BBC reports. The Air Force notified NASA after military satellites picked up the blast, which took place more than 16 miles from the Earth's surface with 10 times the energy released by the Hiroshima atomic bomb. NASA is checking with airlines to see if there were any sightings. The explosion was the biggest since the one over Chelyabinsk in Russia six years ago; because that blast took place over a city, security and cellphone cameras captured images of it, per the Guardian. 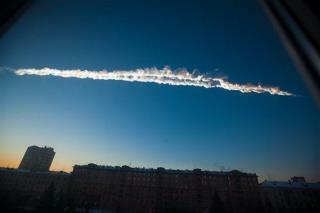 NASA said it expects a fireball as big as the December one only two or three times a century. Scary how most of the small ones are never seen and are capable of Tunguska level of destruction. "Hey, Did Anyone See That Meteor Explosion?" "No,uhh okay, well umm there's nothing to worry about here...uhh ignore what I said...carry on"